It was a great day in Je-ru-sa-lem. Feast day and the peo-ple moved a-bout. Mon-ey chang-ers were in the tem-ple there. Je-sus in his ang-er drove them out. Sheep were in this sac-red place. Why these doves in this house of pray'r? With a cord He drove all the sel-lers out. O-ver-turned the bench-es that were there. Then the mon-ey rolled as he cleared the court. All was qui-et as the mer-chants leave. 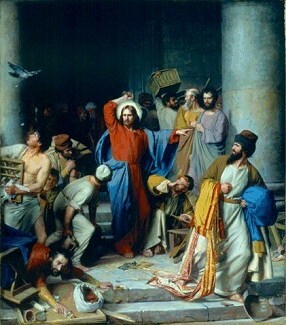 Je-sus healed the blind and lame. Or-der was re-stored in the house of God. From the lips of child-ren per-fect praise. Print lyrics "The Unclouded Day"
Hear the tune "The Unclouded Day" by Josiah K. Alwood. Press "Go" to search for books about Jerusalem.